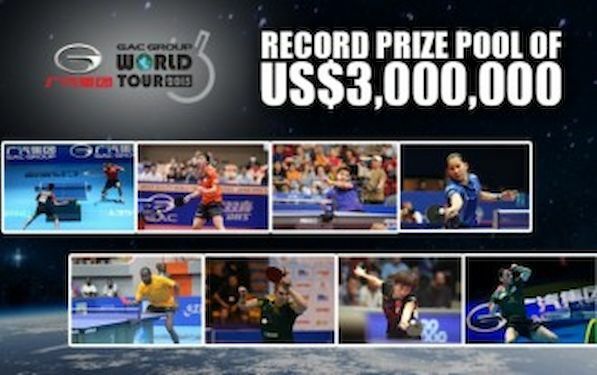 The GAC Group 2015 ITTF World Tour is set to be the most lucrative Tour of all time, with the ITTF announcing that a record US$3,000,000 prize money will be on offer for the world’s best table tennis players. In 2015, the GAC Group World Tour will be made up of 23 events in 23 countries, making it the biggest ever World Tour in ITTF history. New World Tour stops in 2015 include North Korea and Bulgaria, and the GAC Group 2015 World Tour will touch all corners of the globe in 2015, making it a truly international tour. In addition to offering the highest prize money in history, the 2015 World Tour will also be the most viewed in history, with more events shown live throughout the world on television and all the events being shown live on ITTF’s live streaming platform, itTV. As was the case in 2014, the GAC Group 2015 ITTF World Tour will be split up into three tiers (highest first): Super (6 events), Major (6 events), Challenge (11 events). The higher the series, the more prize money, World ranking points, World Tour ranking points and higher quality of competition on offer. The top 16 singles and top 8 doubles pairs of the World Tour point standing will then be invited to the prestigious World Tour Grand Finals at the end of the year, a location to be announced later. ITTF’s 970,000 social media followers on Facebook, Twitter, Instagram, YouTube, as well as Sina and Tencent Weibo will be in a prime position to receive exclusive content from what will be the most social #ITTFWorldTour in history. The GAC Group 2015 World Tour kicks off in Hungary on 28 January 2015. Check out the full World Tour calendar here and a breakdown of the prize money here..